It’s around 2:30 am…there’s still some fading twilight casting faint shadows on the stark tundra along the mighty Kazan River in Nunavut, Canada. 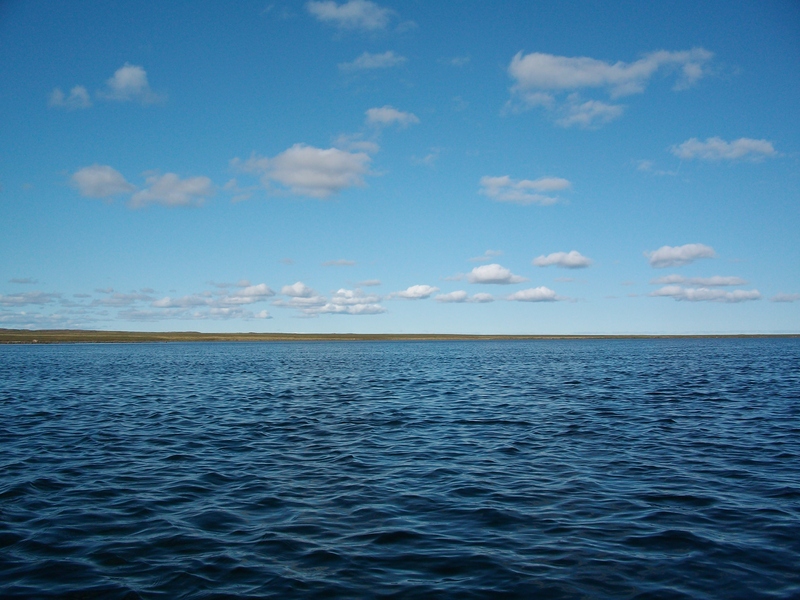 Its day 14 or 15 (I lost count) of a 3-week canoe expedition – dropped by bush plane next to Yathkyed Lake, an indistinct lake that looks like all the other myriad of lakes up here, and planned to paddle 200 miles or so to the Inuit Village of Baker Lake. We’d be picked up by that same plane at the end of our trip in an unplanned rendezvous (rescue?) when it was apparent we would fall well short of our destination, low on food and out of time…but that’s another story. “We” were a group of six, members of the Maine Outdoor Adventure Club. Right now, I’m trying to wiggle my sleeping bag pad around on the tundra hummocks under my tent to find the best spot to sleep. The ground is covered by moss, lichen and cotton grass, along with more than a few goose and caribou droppings. It should be plenty soft, but the vegetation is sparse and the ground is stony….usually takes more than five tries per tent stake to gain anchor. We’d finished dinner around 10:45pm, stored the food for the night, and stacked it 40 yards or so from our “kitchen” bug tent – our token and steadily reducing “ safe” distance from foraging barren ground grizzly bears. I’m in the tent by 11, and spend the next half hour on my tent “chores”: organize my gear, log in the days entries on my GPS, mark the camp location on the map and get a feel for the days’ progress, and what’s coming up tomorrow. I change out of my damp dirty day clothes into my damp dirty sleeping clothes – I realized around day five that it would be a while before I felt dry clothes, with most days damp and around 50 degrees for a high, and no fires to dry stuff because there’s nothing to burn on the tundra. I lay my jackets and extra clothes next to my sleeping bag to be ready to pile on when it gets cold in an hour or so. We try to paddle, ferrying the boats diagonal to the wind and angling just down-shore, but have to give up and walk them a mile or so along the shore to make progress. We take a 2-hr lunch break waiting to see if the wind would settle enough to allow us to paddle around a dangerous exposed point. During that lunch we talk about Lewis & Clark; days like this give us a small snap shot into what it must have been like to be on a real expedition and to deal with all the unforeseen issues, gear, and so on, and keep making forward progress and at the same time keep up with all the geographic, scientific, and social aspects of that trip….truly amazing. After we regroup on the lee side of the lake, figure out location, change out of soaked clothes, it’s back into the canoe. Again the ping pong nature of the paddling, as we have an easy downwind crossing with gentle quartering waves, and a wind that seems to take a break. But all too soon, the river enters a major set of rapids. It’s already 7:30 pm, and we potentially could line part of it to shorten what is sure to be a tough portage, but we’re all exhausted, so we decided to just scout the rapids and make camp. Tons of grizzly bear sign. The rapids are big and powerful….there wouldn’t be any running or lining the canoes here, so we start into the nightly routine of unpacking the canoes, and “feeling out” the site for where the tents and the kitchen could go. Locating the tents is a somewhat comical process, seemingly reflective of the groups mood. Some nights all five tents are within a 30 yard circle…. tonight we’re spread out over a quarter mile of the river. It’s not dependent on how much “space” we need for our tents but more about the space we need for our states of mind. But its also apparent we have different strategies for tent site selection: some opt for the grassy area near where we pulled the canoes out of the river (the “I can barely move” site); one is near a large rock close to the kitchen (the “I want my morning coffee FAST” site); the last tent is well down a possible caribou trail where we’ll likely be portaging in the morning (the “I want an easy morning” site). When you first see the caribou trails, you can’t help that your first knee-jerk thought is “how the hell did ATV’s get out here”; the trails are everywhere, worn to bare dirt, and weaving along all water courses, typically in parallel fashion in increasing elevations from the water. The tents go up and then we tackle dinner. Back in the tent…some nights I go to sleep listening to the prehistoric sounding trumpet calls of the sandhill cranes, or the comical cackling of the rock ptarmigans. Tonight it would be nice to go to sleep lulled by the symphony of the rapids, but I can barely hear them, even though my tent is within a stones throw. Instead I’m listening to what seems like a troop of first-night-at-camp cub scouts buzzing around my tent, beating on it with broom sticks in a twisted drum ensemble. Slight pauses followed by violent shaking where they all seem to swing at the same time, extra hard. It’s the wind. The voice of the wind is like a constant humming baritone drone over the low ridge behind our camp site. Last night had been dead calm when we made camp, but since then the wind had been strong enough that I was worried my tent stakes wouldn’t hold, and I did a “minds” inventory of what gear would fly out and how far it would go, from the stuff I stored in my tent vestibule. The wind on this trip has been a revelation…..imagine that, wind on the tundra…..go figure. But imagining it is far different than experiencing it. Day two of this trip had been greeted by a blow that lasted almost two days, keeping us pinned down, and putting us behind right from the start. Driving rain and winds over 50 mph that collapsed three of our five tents, breaking poles and tearing fabric….our Kazan welcome! Each day, an important part of the routine was securing the canoes at every stop, and especially at the end of the day in every way possible….locating them in “dips” if you could find them, multiple ropes tied to the biggest rocks you could find, laying rocks on the boat, and so on. Our pilot had warned us about it….and told us stories of poorly secured canoes literally blown into the sky and lost. Yeah, so no exaggeration there. The routine aspects of this trip leave little time for idle activities like reading, thinking, or fishing. This is an “elemental” vacation in that days are filled with the tasks at hand to be safe and secure…setting up and breaking camps, and the mountain of associated tasks for the group and yourself. There’s the daily loading and unloading of the canoes, the paddling to make progress, the navigating on the lakes, meals and snacking to feed the “machine” to keep all this going, and hopefully, sleeping. But no sleeping tonight….the wind is too violent. A few more minutes, and it’ll be the middle of the 6 hour night, and the urge rises to peak out to see if there are any northern lights….an urge typically conflicted by the sharp chill and the desire to pull the first layer of excess clothes over my bag. I reach for the extra clothes, admitting a defeat of sorts. Tomorrow, we’ll do it all over again for day 15. If you’re interested in a truly adventurous and remote canoe expedition, consider the Kazan River, a 600-mile long Canadian Heritage River located west of Hudson Bay. You’ll experience great prizes of nature: the full force of its elements, endless horizons, close encounters with wildlife….you’ll feel life and nature breathe, and use all of its lung capacity. The scenery is profound in its simplicity. Your visual senses aren’t assaulted with mountains, trees, buildings…..its water, a thin carpet of green (in the short green season), but mostly……sky. And that’s where you’ll experience the only visible link to humanity…..occasional jet crossings on some northerly route that provide fodder for countless small conversations in the canoes, guessing from where to where they were going. Be prepared that paddling the Kazan River often is more like lake paddling. The river, like many tundra rivers, passes through a large number of tundra lakes, and even when it’s not, it’s a pushy and often very wide river. You won’t escape the wind. You’ll see wildlife…and you won’t see wildlife. Some days, a single gull or jaeger was the only jarring paint splash on an otherwise empty canvass of critters. We had close encounters with caribou and musk oxen, and we heard wolves. We avoided direct encounters with grizzlies, and no one minded. The fishing is amazing….enough said. The Kazan is one of the few rivers where you can paddle an extended trip and not see any signs of humans or human disturbance; only a handful of trips are run down the Kazan each year, and apparently these trips admirably abide by leave-no-trace practices. We saw no signs of previous campers…other than the historic camps of Inuits that were stone circles where they tied their tents down securely against high winds. You’d think the land this far north would be full of rivers like it, but it’s not. Mining operations, oil & gas development, and hydroelectric development projects are encroaching everywhere. The Village of Baker Lake is an outpost….but a burgeoning outpost and signs of change are evident…..from the new roads, to the signs catering to visiting engineers and geologists. We never saw a barren ground grizzly…but we saw sign at almost every stop, including a portage across an active food cache with three partially eaten caribou carcasses that absolutely chilled your spine. Barren ground grizzlies are relative newcomers to this part of Nunavut, within the last five years, and Nunavut biologists believe that they’re pushing their way north in response to heavy development and intense resource exploitation to the south. We badly wanted to be plinked down in the middle of a major caribou migration. We saw some, but nowhere near what we had hoped for. We learned from locals that the herd here was suffering, and there have been changes in migratory patterns that potentially were due to roads and exploratory flights and activities for oil and gas projects. I documented a number of species of birds that were well north of where they were supposed to be based on bird books. I happened to be on a return plane with a regional wildlife manager for Nunavut, who told me that this year alone they documented 10 species of birds nesting much farther north than they had been previously recorded. When you test yourself in a setting like the Kazan, and you succeed, the reward is a deep level of satisfaction that’s complex and difficult to achieve in other ways. The remoteness makes rescue difficult at best. The harshness of the weather conditions, even in the summer, has to be respected, and the voracity of the insect onslaught (especially black flies) is enough to drive you insane. Its fundamental to human nature for us to suffer and endure. An extended trip to the Kazan will almost certainly provide more than its share of challenges and frustrations! A good book on the Kazan is “The Kazan” by David F Pelly and Christopher Hanks. Email me if you want information on how we got there and other trip info. I am working on a presentation concerning the importance of a map and compass in successfully arriving at a goal. In this presentation, I talk about a canoe trip my wife and I made 35 years ago. My talk is being recorded on DVD and I would like to make the video recording of my live lecture more interesting by adding some photos. This is a heavily subsidized non profit venture to which I am donating my hours of my time. Your picture of canoeing on the Kazan River is a great slide to give perspective to my talk. Do the rights for this photo belong to you? If so, would you be willing to give me permission to use this photo? Thanks for stopping by Gabriela! I checked your blog out too, and will be stopping by regularly. Thanks for the visit Lynette!